In one of the biggest moves by music industry in India, SaReGaMa has decided to offer 1.1 lakh songs from 14 languages for free, on their website. One of the oldest music company in India, SaReGaMa has rights to over 70% of all Bollywood music ever created. And this move by them can literally kill piracy. In case music lovers want to purchase any song, then there is a flat charge of Rs 9 per song, which seems fair enough. The platform for online streaming and downloading of songs have been provisioned after consulting with various online streaming services present today. All the songs can be downloaded in fidelity of 320 kbps which gives an optimized experience compared with 64 kbps or 128 kbps, which means that high quality of audio has been kept in mind. The users who are paying to download the songs would be provided 10 downloads for each song (by paying Rs 9, using single ID), which can be used to store it in different gadgets such as laptop, desktop, tablet and smartphones. 114 year old SaReGaMa, which was born in England in 1901, has some more interesting plans related with online distribution of their vast treasure of music. For instance, uncompressed audio which has even higher quality would be sold separately, along with plans of launching mobile apps for live streaming of music. Reportedly, 98% of music in India is pirated, which means that genuine artists who create such music are left without any compensation. A study conducted by U.S.-India Business Council (USIBC) in 2008 estimated that piracy of Bollywood movies and music results in direct loss of Rs 16000 crore annually in India (2008 estimate), and takes away 80,000 – 1,00,000 direct jobs from the industry. Considering that ever since music has been digitalized, it has become easier for pirates to copy and sell unauthorized music, it is high time that all big record labels and music companies unite to end piracy and ensure that artists are given their dues. This move by SaReGaMa can certainly be hailed as one of the redefining moments in the anti-piracy campaign of free India. Will it work? 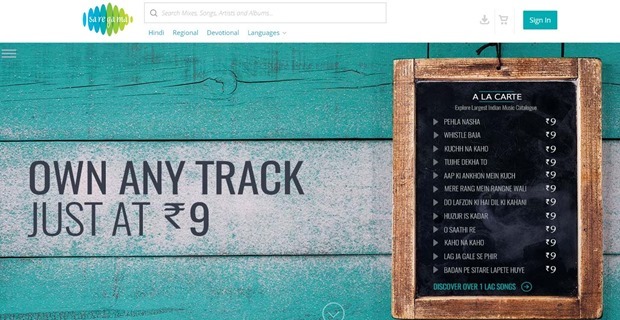 Can a music lover shell out Rs 9 to download a song? Do share your views by commenting right here! #SaveTheInternet Campaign Generates 1.3 Lakh+ Email Responses To TRAI. Govt To Look Into Airtel Zero! No Mr Bansal, Airtel Zero Does Violate Net Neutrality And You Know It. 320 kbps is fine for older songs, would have preferred bit higher quality (Just for AR songs :)). Hope i gonna start spending more money on saregama instead of Gaana subscription. If they provide the old songs in loss-less format, I will certainly buy them. But now,I am good with iTunes Store. They provide better quality with AAC codec. Few years ago, I had purchased some old movie songs from Saregama store which were good, but only 128 KBPS.